Offering over 110 conference sessions across Tuesday, 6 and Wednesday, 7 November, and a full tutorial day on Monday 5 November, we hope you’ll find that this fantastic line up of talks for Percona Live Europe 2018 to be one of our best yet! Innovation in technology continues to arrive at an accelerated rate, and you’ll find plenty to help you connect with the latest developments in open source database technologies at this acclaimed annual event. Representatives from companies at the leading edge of our industry use the platform offered by Percona Live to showcase their latest developments and share plans for the future. If your career is dependent upon the use of open source database technologies you should not miss this conference! See the full list of tutorials. 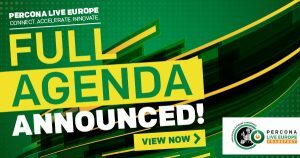 If you would like to join them Sponsorship opportunities for Percona Live Open Source Database Conference Europe 2018 are available and offer the opportunity to interact with the DBAs, sysadmins, developers, CTOs, CEOs, business managers, technology evangelists, solution vendors and entrepreneurs who typically attend the event. Contact live@percona.com for sponsorship details. Ready to register? What are you waiting for? Costs will only get higher!